Grain Handling Solutions is owned and maintained by Ripco Ltd. Ripco is a leader in design, construction and wholesale distribution of material handling, conveying, storage and drying equipment for farm and commercial customers. This site serves an on-line catalog for over 150 types and models of grain handling equipment, parts, accessories and used augers. At Grain Handling Solutions, we appreciate the opportunity to also custom design and construct all sizes of grain handling systems. If you are out of our construction territory, we can help you find the right installation experts near you! Give us a call and take the guesswork out of your next grain handling purchase. Ripco Ltd was founded in 1962 by Gerald Sorgius. For over 50 years, Ripco has been a family owned business serving the Indiana, Illinois, and Kentucky region and is headquartered in Otwell, Indiana. Ripco Ltd is the parent company for Ripco Systems and Ripco Distribution. 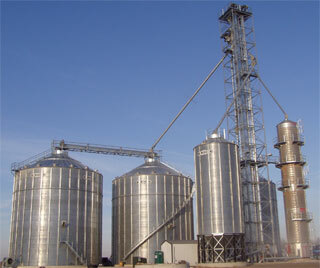 Ripco Systems specializes in the custom design, site preparation, concrete and the construction of complete grain systems. Ripco Systems has a dedicated team of engineers, fabricators, millwrights, electricians and service techinicians. Ripco Distribution is a leader in the wholesale distribution of grain handling, conveying, storage and drying equipment in the industry with locations in Otwell, IN, Milford, IN and Rock Falls, IL.